Greening programs for urban residents, businesses and institutions. For more than 50 years, Credit Valley Conservation (CVC) has been working with the community to protect and restore the Credit River Watershed. CVC undertakes research, education, and implementation of environmental solutions. 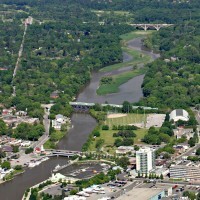 The Credit River flows through a diversity of landscape types – from protected natural areas to rural farms and villages, to urbanized environments. CVC works in all of these areas to help sustain the natural environment for present and future generations. The Green Cities Program concentrates on actions each of us can take to help protect and restore the natural environment on all urban lands in the Credit Valley Watershed, including residential, corporate/business, institutional and public lands. Our specific focus is environmental landscaping. Through the Green Cities Program CVC works with our partner agencies, organizations, businesses and residents to provide education, and hands-on assistance with select sites. In addition, CVC and our partners conduct research on urban ecosystems and support pilot projects. This research helps us identify priorities and monitor the results of urban greening initiatives. A Green City is a healthy, sustainable, liveable city with a healthy natural environment, healthy people and a thriving economy. A Green City has clean air, water and soil. In a Green City, homes and businesses are nestled among abundant trees, natural areas, and greenspaces. Urban wildlife such as birds and frogs can also thrive in a Green City. Everyone can help make this vision a reality. Whether you own, rent, manage or simply enjoy outdoor spaces, you can take part in the Green Cities Program. reducing or eliminating pollutants, such as litter, oil spills and overuse of de-icing salt. What are the benefits of environmental landscaping? One of the unintended negative consequences of past urban expansion has been a loss of natural areas and an increasingly degraded natural environment. In addition, our urban areas are subject to broader environmental problems, such as global climate change. contribute to the quality of life and human health. How can you participate in CVC’s Green Cities programs and projects? The Your Green Yard Programprovides workshops and information on various aspects of environmental landscaping for residents. If you live adjacent to a natural area, we can also provide information on how you can contribute to its protection and restoration. Your business, corporation, place of worship, health facility or post-secondary school can become a member of our new Greening Corporate Grounds Program. Along with adopting environmental landscape maintenance practices and planting native plants, you can choose from a selection of additional projects. CVC will provide information, planning assistance, an on-site sign, and a listing on our website. Along with our partner Evergreen, we can also assist with staff or volunteer planting events. CVC works with our urban municipal partners on public lands, and we continue to adopt environmental practices on our own lands. Every year, hundreds of CVC Conservation Youth Corps students and other volunteers plant trees and assist with other activities on public lands. You can join these volunteers, or simply help care for our shared natural areas and greenspaces whenever you visit. Our urban research projects currently include the Lake Ontario Shoreline Strategy and studies of various urban streams, wetlands, ponds and forests. This research enables us to establish priorities and monitor the results of urban greening. In addition, we support some pilot sites to aid with testing select outdoor environmental practices. To participate in research or access results, watch for meetings or notices and check the CVC website.